It's Friday night and I am tempted to stay in the house and relax from my long week, but I am invited to Oakland Museum's new exhibit, The Birth of the Cool. My kids and I head out and meet my friend and her kids at the Museum Cafe where we hear live music and my kids grab a hot dog. At the cafe there was a dance floor packed with people dancing to old school and James Brown classics. Here I took a snap shot of my kids with the Mayor of Oakland, Ron Dellums, and after a few songs we headed to the exhibit where we saw mid-century classic furniture, art and music. We also saw graffiti art, skateboarding culture, 50's animation and all things cool. 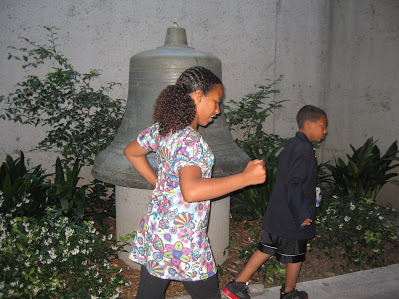 After touring the art, the kids ran outside and enjoyed the beautiful grounds of the Oakland Museum including the ponds filled with Koi fish. I realized that I had a birthday party to attend Saturday so I had a successful stop at the Museum store, where I found a few presents, a cool travel cup for my coffee and plenty of other items that I may put on my wish list. As my kids and I were heading home I realized that Mignonne Decor in Oakland was having an art gala for Oakland artist, Nicole Hanshaw. I made it into the store that was open late and mingled with the artist Nicole and the owner Johnelle. Here I saw many vintage French inspired home accessories and art that would work well as accents in my 1951 Ranch/ contemporary home. As we were driving home, I was happy to see my beautiful Oakland a glow with possibilities.